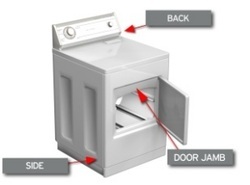 A broken dryer can be more than a simple irritation, it can pose a safety hazard as dryer fires are possible. Our Calgary and area dryer repair specialists are highly-trained, timely and conscientious, providing you with the best service possible for all your dryer problems. Our goal is to repair your dryer on our first visit to save you both time and money. 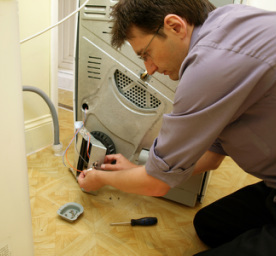 Appliance Force’s technicians are specially trained to deal with both 220 volt electricity and natural gas dryers and will do a number of tests to identify the cause of any problem. In any dryer, the machine needs to have heat, mechanical action and airflow to properly dry your clothes and so we will examine the venting/ducting, screening, heater/blower, motor, thermostat, condenser systems and control panels. Once we determine where the fault lies, we will provide you with a full diagnostic quote based on the Canadian Appliance Guide Rate. Our approachable technicians can answer all your questions so that you are comfortable and confident with the quoted service. Clean the lint tray thoroughly. Make sure the power is working properly and the breaker isn’t tripped. You should also try unplugging the dryer for 15 minutes to reset it. Check the dryer vents. Are they connected and clear? Ensure your dryer is level and hasn’t shifted. Check for any loose items that may be causing noises. While you are checking these items, you can also collect the model and serial number off your appliance so that you have them accessible when booking your appliance service.